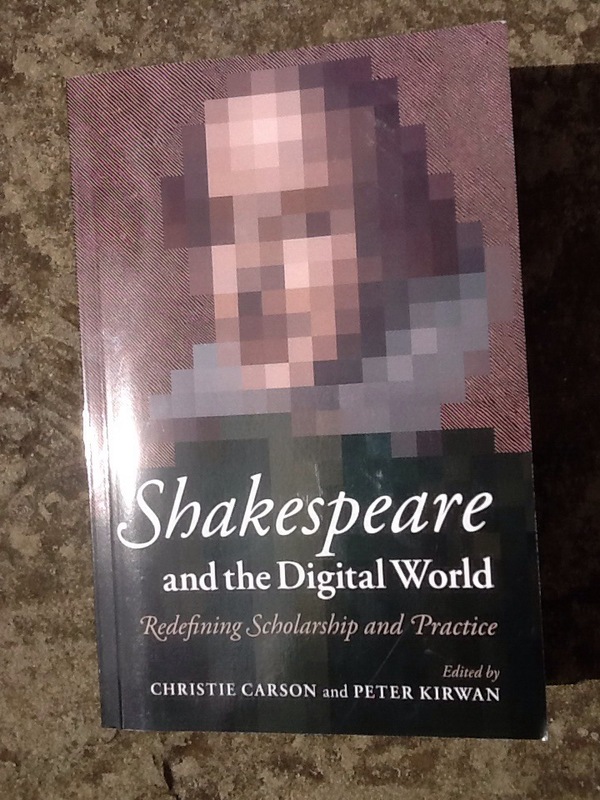 A question I was left pondering after part 1 of Shakespeare in the Digital World was whether or not digital research was inherently more or less social than its non-digital counterpart. Bruce Smith argued strongly that it was less social, less experiential, less time-bound–in a word, less human. But David McInnis also showed how fundamentally collaborative some digital projects are, and how this enables a form of international social and professional exchange that simply wouldn’t have been possible a few decades ago. I bring up the social here because in part 2 of this book, which focuses on TEACHING, similar questions relating to digital interaction, sharing, and sociability make up a central theme. In his introduction to the section, Peter Kirwan points out how active, up on your feet, interactive approaches to Shakespeare have dominated many pedagogical discussions in recent years. ‘The focus on physical bodies, proximity and movement tends to gloss over the integration of new technologies’, he writes, ‘except when that technology reinforces the live classroom’ (p. 59). This recent emphasis in Shakespeare studies on pedagogy as a kind of theatre is interesting and provocative in and of itself (is your classroom ensemble-led, or more the director’s theatre variety? ), but in this post I will restrict myself to saying a few words on these issues specifically in terms of the digital. I will keep it to a few words though, since one of the essays in the section is in fact by me and so to a large extent I’ve already said my piece on the subject, both in the essay itself and in a previous blog post here. Sarah Grandage and Julie Sanders, Sheila Cavanagh and Kevin Quarmby, and Peter Kirwan himself have written the other essays in the section, and together we cover experiences relating to distance learning, blended classrooms, joint teaching via video conferencing, collaborative class wikis and Twitter hashtags, and new resources for teaching performance online. As I read the essays together I found myself underlining phrases like ‘experiential creativity’, ‘digital connectors’, ‘socializing practices’, and jotting down notes such as ‘social facilitation’, ‘experience, experiment’, ‘interactivity, engagement’. I suppose this emphasis on digital pedagogy as collaborative and social shouldn’t come as too much of a surprise, given the fact that the Web 2.0 tools so frequently discussed in this section are essentially what we know as social media. But it is interesting, I think, to see how all of us have emphasized social liveness and communal exchange in our reflection, with the assertion very often being that not only can digital teaching be as social as its non-digital counterpart, it can sometimes be more so. I think that’s right, but it’s an idea that is worth further consideration. In their discussion of joint teaching via Skype, Cavanagh and Quarmby explain how students recognized the authority and presence of the Skyped-in instructor as fully as they did the co-instructor that they knew in the flesh. ‘The virtual presence was, albeit unconsciously, fully integrated into the class psyche’ (p. 93). All of the essays, in one way or another, talk about habituation to the digital. That is–once we get used to using it and seeing it, it no longer becomes something that is different, or worryingly non-human. It is simply part of normal life. I am reminded, though, of Bruce Smith’s comment in part 1: ‘If I have learned anything since I started teaching in 1972, it is to distrust binaries … What is needed in every case is a third thing, a tertium quid, a synthesis that reconciles thesis and antithesis’ (p. 28). Leaving aside the question/joke of what Smith makes of binary code, I am left wondering what the third thing might be for digital sociability. It is certainly not inhuman or beyond the human–we are, after all, the agents (or subjects?) driving and making it–but neither is it a part of human experience and exchange as we’ve previously known it. What is the synthesis then that lies, unconsciously, in between? Alongside the discussion of big questions like this one, the section offers a helpful range of practical ideas and tips that I’m sure I’ll be making use of in my own teaching. From performance resources available online, to how to create a sense of presence through the Skyped screen, to how to use a student-led wiki to fuel research, there’s lots to think about and work with here.